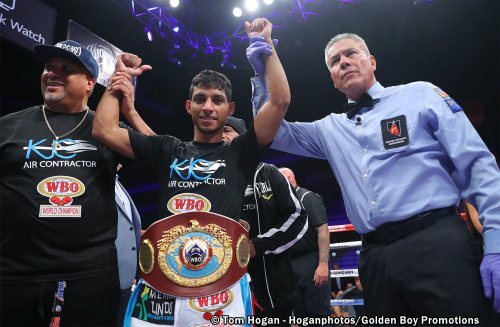 LAS VEGAS (Oct. 12, 2018): Puerto Rican knockout artist Angel "Tito" Acosta (19-1, 19 KOs) defended his WBO Light Flyweight World Title against Mexican warrior Abraham Rodriguez (23-2, 11 KOs) via thunderous knockout at 1:02 of the second round of the scheduled 12-round main event of the Oct. 13 edition of Golden Boy Fight Night on Facebook Watch at The Joint at the Hard Rock Hotel & Casino, Las Vegas. The action was streamed live globally on Facebook Watch via the Golden Boy Fight Night Page. "I want to thank my team and my family," said Angel Acosta. "I couldn't have done this without them. We were working on the left hook in the gym. My team told me to use my jab to keep looking for him, and then I found him. I want to fight this year or when the year stars." Angel Acosta is all smiles after dispatching Abraham Rodriguez. "Thank you to my opponent for doing a good job," said Bakhram Murtzaliev. "I'm on my way to world championship fights. This was a very good experience for me. I want to get some rest and see what's net with my team"
Murtazaliev connects with a left a Gonzalez. "I'm in Vegas, baby! So, I got to dance and have fun," said Rashidi Ellis. "Corral's a veteran and has been in a lot of tough fights, but I did what I needed to do. He complained to the ref because he was looking for excuses. He was looking for a way out." "It was a good fight," said Maiirim Nursultanov. "Freeman is a tough opponent. I wanted the knockout, but I'm happy with the victory." 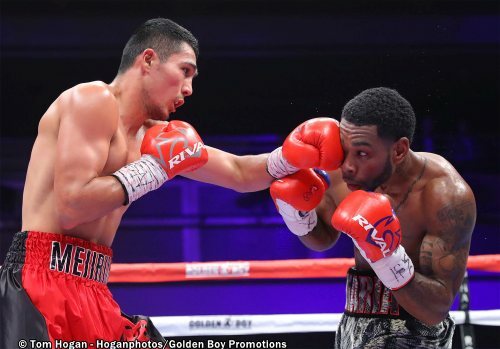 "He [Ferman] is a good, strong fighter," said Enriko Gogokhia. "He didn't throw many combinations because he was trying to get me with one punch. It was a good fight." 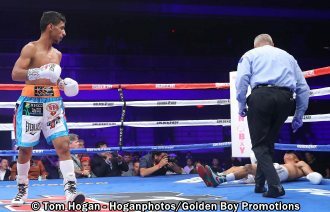 Acosta vs. Rodriguez was a 12-round fight for the WBO Light Flyweight World Title presented by Golden Boy Promotions and Miguel Cotto Promotions. Murtazaliev vs. Gonzalez is a 10-round junior middleweight fight presented by Main Events and Golden Boy Promotions. The event is sponsored by Tecate, "THE OFFICIAL BEER OF BOXING" and Hennessy, "Never Stop, Never Settle." The fights took place on Saturday, Oct. 13, 2018 at The Joint at the Hard Rock Hotel & Casino, Las Vegas. 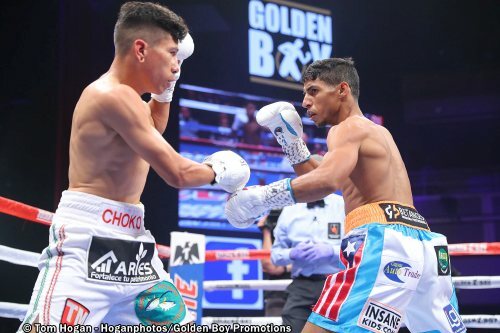 The action was streamed live globally on Facebook Watch via the Golden Boy Fight Night Page.